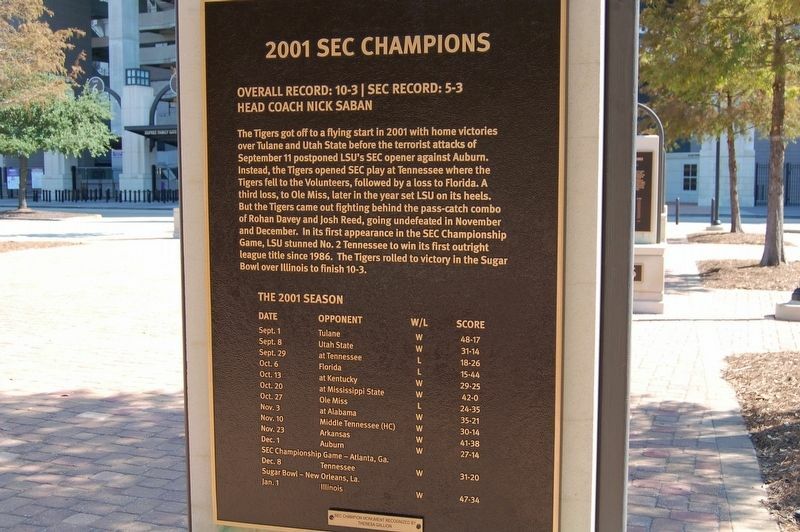 The Tigers got off to a flying start in 2001 with home victories over Tulane and Utah State before the terrorist attacks of September 11 postponed LSU's SEC opener against Auburn. Instead, the Tigers opened SEC play at Tennessee where the Tigers fell to the Volunteers, followed by a loss to Florida. A third loss, to Ole Miss, later in the year set LSU on its heels. But the Tigers came out fighting behind the pass-catch combo of Rohan Davey and Josh Reed, going undefeated in November and December. In its first appearance in the SEC Championship Game, LSU stunned No. 2 Tennessee to win its first outright league title since 1986. The Tigers rolled to a victory in the Sugar Bowl over Illinois to finish 10-3.
. Marker is in this post office area: Baton Rouge LA 70803, United States of America. Touch for directions. Other nearby markers. At least 8 other markers are within walking distance of this marker. 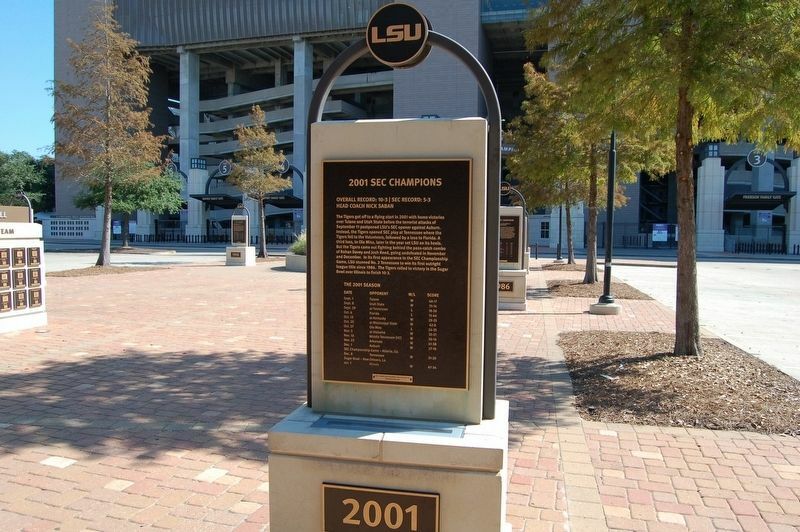 1986 SEC Champions (a few steps from this marker); 2007 SEC Champions (a few steps from this marker); 1988 SEC Champions (a few steps from this marker); 1970 SEC Champions (a few steps from this marker); 2003 SEC Champions (a few steps from this marker); 1961 SEC Champions (a few steps from this marker); 1958 SEC Champions (a few steps from this marker); Billy Cannon (a few steps from this marker). Touch for a list and map of all markers in Baton Rouge. More. 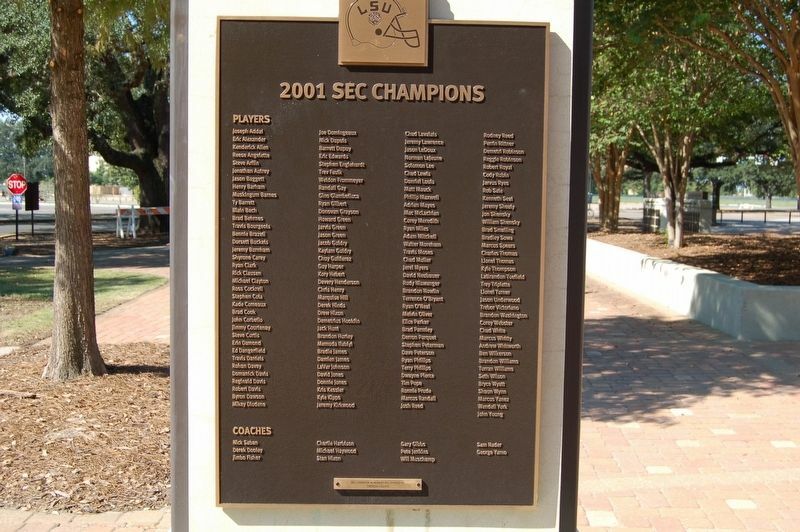 Search the internet for 2001 SEC Champions. Credits. This page was last revised on November 4, 2016. This page originally submitted on November 4, 2016, by Cajun Scrambler of Assumption, Louisiana. This page has been viewed 249 times since then and 5 times this year. Photos: 1, 2, 3. submitted on November 4, 2016.